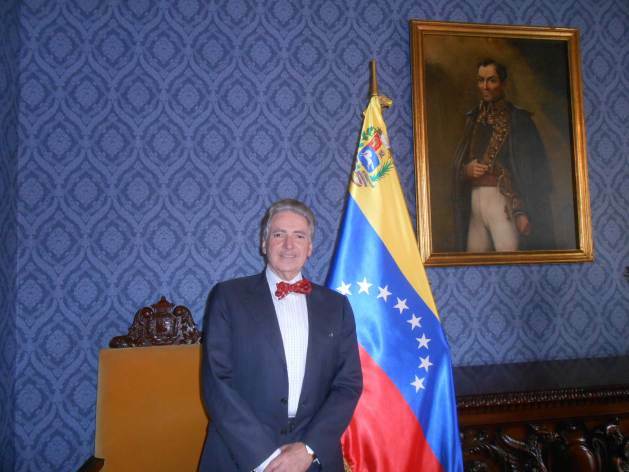 Alfred de Zayas at the Venezuelan Foreign Ministry. GENEVA, Mar 12 2019 (IPS) - My mission to Venezuela in November/December 2017 was the first by a UN rapporteur in 21 years. It was intended to open the door to the visit of other rapporteurs and to explore ways how to help the Venezuelan people overcome the protracted economic and institutional crisis. In preparation of the mission I studied all pertinent reports by the Inter-American Commission on Human Rights, UN High Commissioner, Amnesty International, Human Rights Watch, Provea, Fundalatin, Grupo Sures, Red Nacional de Derechos Humanos, etc. During the mission, thanks to the professionalism of UNDP, I was able to meet with members of the opposition, National Assembly, chamber of commerce, churches, professors, students, representatives of OAS, Carter Center, victims of violence, and civil society. Since my mother tongue is Spanish, it was easy to inter-relate with Venezuelans, walk the streets, visit the supermarkets. I learned about the scarcity of foods and medicines, black markets, smuggling of subsidized petrol, foods and medicines into neighbouring countries. The situation did not reach and still does not reach the threshold of a “humanitarian crisis” as we know from Gaza, Yemen, Syria, Sudan, Haiti, etc. A major obstacle to solving the problems was the polarization of the population and the dearth of confidence-building measures. I recognized that the government needed advisory services and technical assistance from UN agencies in order to carry out needed economic and institutional reforms. I convened a meeting with UN agencies in order to explore concrete strategies. In a 6-page confidential memorandum to the government and in my report to the UN Human Rights Council I formulated constructive recommendations, some of which were quickly put into effect. I had requested the release of 23 detainees, 80 were released on 23 December 2017, more in the course of 2018. UN agencies noticeably intensified their assistance, in particular FAO and UNIDO, especially to manage the impacts of the sanctions. 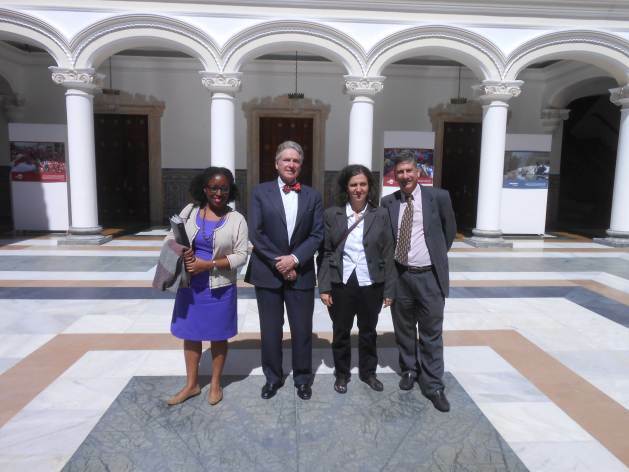 Alfred de Zayas with his team at the seat of the Venezuelan Foreign Ministry. Following my visit I continued to follow developments and study documentation, statistics and arguments from all sides. My diagnosis: The crisis is not caused by the ideological “failure of socialism as an economic model” (socialism has not failed in Norway, Sweden, China), but by concrete and palpable causes, the dramatic fall in the price of crude oil, the over-dependence on exports, the failure to diversify the economy, an excess of ideologues and relative scarcity of technocrats in government. Most importantly, the crisis is the result of the cumulative impacts of 20 years of internal and external economic war, financial blockade, and sanctions. The mainstream narrative attributes the crisis to incompetence and corruption, but these also plague most Latin American countries. Besides, the level of corruption in Venezuela in the 1980’s and 1990’s was higher and Chavez won the 1998 elections on a wave of disgust at the corruption of the neo-liberal governments. I spent two hours with the current Attorney General in Caracas, from whom I received ample documentation on the government’s vigorous anti-corruption campaign, investigations and on-going prosecutions. US efforts to topple Chavez started early, and the CIA cooperated with the Venezuelan oligarchy in the failed coup against Chavez on 11/12 April 2002. The 48-hour President Pedro Carmona had promptly issued a decree doing away with 49 pieces of social legislation, suspending the Supreme Court, the Chavez National Assembly, dismissing governors, etc. Although there is nothing more undemocratic than a coup – Carmona and the US media spoke of “restoring democracy” in Venezuela. Back in 1970, when Allende was democratically elected President of Chile, Nixon called in Kissinger and told him that the US would not tolerate an alternative socio-economic system in Latin America and that the US would make the Chilean economy “scream”. When in spite of sanctions the Allende government proved resilient, it was necessary to use more muscle and General Pinochet carried out the coup that ushered 17 years of “democracy” – and torture – in Chile. As we know from the studies of Stephen Kinzer and William Blum, US Military and CIA interventions in Cuba, Haiti, Dominican Republic, Grenada, Panama, Nicaragua, Paraguay etc. have cost tens of thousands of lives and brought untold misery to millions of Latin Americans. “Human Rights” has nothing to do with the US Venezuela policy. As it was in Iraq 2003 and Libya 2011, it is OIL. The US covets the largest oil reserves in the world, as well as the third largest reserves in gold and coltan. If Maduro is toppled, it will be a bonanza for US investors and transnational corporations. What is sad is that some countries ostensibly committed to democracy, the rule of law and human rights, are supporting the sanctions and the Guaidó coup. We observe a Machiavellian, cynical instrumentalization of human rights and humanitarian aid for purely geopolitical reasons. A solution of the crisis depends on direct dialogue between the opposition and the government. Such dialogue already took place in 2016-2018. Former Spanish Prime Minister Jose Luis Rodriguez Zapatero hosted these talks and arrived at a reasonable accord. On the day of signature, 6 February 2018, Julio Borges, the leader of the opposition refused to sign. This augurs badly for any kind of international mediation by the UN Secretary General Antonio Guterres, by the High Commissioner for Human Rights Michelle Bachelet or by Mexico and Uruguay in the context of the Montevideo mechanism. History shows us that sanctions kill, and when the level of killing reaches a certain threshold, sanctions become a crime against humanity. This is a worthy challenge for the International Criminal Court. What Venezuela needs is an end to sanctions and interference in is internal affairs, an end to the violations of Articles 1-2 of the UN Charter and of articles 3, 19 and 20 of the OAS Charter by the US and its “coalition”. Venezuela needs international solidarity and respect of its sovereignty. Alfred-Maurice de Zayas (USA, Switzerland), Professor of Law, Geneva School of Diplomacy (J.D., Harvard, Dr. phil. Göttingen) . Former UN Independent Expert on the Promotion of a Democratic and Equitable International Order, former Secretary of the UN Human Rights Committee, former Chief of the Petitions Department at the Office of the UN High Commissioner for Human Rights. Author of 9 books and numerous scholarly articles. The views expressed in this article are those of the author and do not necessarily represent the views of IPS. I salute your sincere engagement, your decency and your courage. It is a scandal that the UN Human Rights instances have not followed through on your urgent recommendations. They will be held responsible for any further unjustifiable human suffering in Venezuela.